Do I Need a Permit for Roof Replacement? Your roof is considered part of your home’s envelope. The envelope is the entire exterior of your home that seals it off from the big wide world outside. While your entire envelope is important—well-insulated walls, properly sealed windows and doors—your roof is its most significant component. If you have drafty windows or doors, your energy bills could go up, and your house might feel less comfortable. But when your roof has problems, the very integrity of your home is threatened. So when you’re dealing with such an essential part of your home, you want to make sure the work is done right. But does that mean you need a permit for roof replacement? The answer is, frustratingly, that it depends. Even a minor leak in your roof can lead to serious water damage that costs thousands of dollars to repair. Water damage can also lead to dangerous mold that requires extensive remediation. Damage to your roof can also create an opening for pests. If rodents infiltrate your roof and take up residence in your attic, you could be in for some steep losses. Rats or mice can cause significant property damage. You will also need professional pest removal in addition to the repair bills for your roof. Another threat that many homeowners are unaware of is the risk of carbon monoxide poisoning. An inexperienced or unskilled roofer can knock loose part of the venting for your furnace or other appliances. When that happens, carbon monoxide can build up in your attic or crawl space instead of venting out. Hiring experienced roofers and getting the job done right could save your home or even your life. Part of doing the job right is pulling the appropriate permits. So it’s crucial to know when you need a permit for roof replacement. 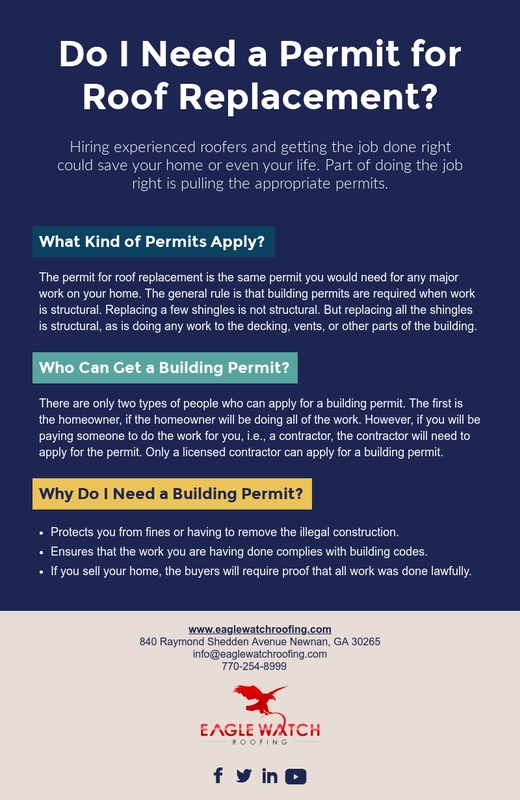 The permit for roof replacement is the same permit you would need for any major work on your home. If you are doing renovations, building on an addition, or just making structural changes, you will need a building permit. However, there are some exceptions. Usually, any work that costs over $10,000 will need a permit. However, if the work is minor enough, a permit may not be required. Building permits are issued by cities and counties, so the exact requirements and exceptions vary by city and county. However, a look at the regulations in Atlanta gives a pretty good idea of what does and doesn’t require a building permit. If you are just replacing your kitchen cabinets, an interior door, or a small patch of drywall, you won’t need a permit. The same is true of interior and exterior painting, flooring (e.g., carpets or tile), and wall coverings (e.g., wallpaper or wood paneling). The general rule is that building permits are required when work is structural. What exactly that means can vary slightly by municipality. However, structural work is usually work that affects the actual bones of your home, the parts that hold it all together. So minor repairs to a deck are not structural, but building a new deck or replacing joists would be structural. In the case of roofs, minor repairs or replacing a few shingles is not structural. But replacing all the shingles is structural. If you will be doing any work to the decking beneath the shingles, or moving around vents, that is definitely permit-worthy and you would need a building permit for roof replacement. There are only two types of people who can apply for a building permit. The first is the homeowner. If the homeowner will be doing all of the work and not hiring outside help, they can apply for the permit themselves. However, if you will be paying someone to do the work for you, i.e., a contractor, the contractor will need to apply for the permit. Only a licensed contractor can apply for a permit. A general contractor can also apply for a permit that covers their subcontractors. As we said above, only a licensed contractor can apply for a building permit. So if you don’t have a licensed contractor, you won’t be getting a building permit for roof replacement. That could be a big problem if a building inspector happens to notice your work. If an inspector sees that you are doing work without the required permit, they can order all work to stop until you get a permit. If your roof is torn up and has not been fully replaced, stopping work could leave you and your home unprotected. You or your contractor could also face a fine for performing work without a permit. In the worst case, you could be ordered to remove any work that was done without the necessary permit for roof replacement. In other words, you could be required to completely rip up your brand new roof. Typically, any contractor who will be doing more than $2,500 worth of work requires a license. If they are doing less than that, chances are you don’t need a permit for roof replacement anyway. But hiring a licensed and insured contractor is still a good idea. To get a license, a contractor needs to pass exams and show proof of experience working under a licensed contractor. 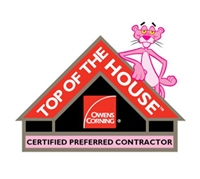 So using a licensed contractor ensures that you are getting an experienced, skilled roofer. In addition, using a bonded and insured contractor can save you from big trouble. Bonding and insurance protect both you and the contractor in case someone is injured on the job or something goes wrong with the job itself. Without it, an injury could leave you open to a civil lawsuit for huge amounts of money. Having a permit for roof replacement when it is required protects you in many ways. First, it protects you from fines or having to remove the illegal construction. But it also ensures that the work you are having done complies with building codes. That’s a good thing. Building codes exist as accepted standards of quality work. When your roofer builds to code, you can be sure that every aspect of the construction meets the standards set by industry experts. In addition to the value you get from working with a permit, having a permit for roof replacement is critical if you ever sell the house. Having a new or relatively fresh roof on your home is a great selling point. If a buyer knows that they will be putting money into an aging roof in the near future, they can ask to deduct those costs from the purchase price. In some cases, you may even need to replace the roof as a condition of the sale. On the other hand, a new roof adds value to your home, since it provides some financial security for the buyer. But if you’ve had your roof replaced, any buyer will want to see proof that the work was done lawfully. If you can’t produce the permit you received for the work, that could cause significant complications with the sale. 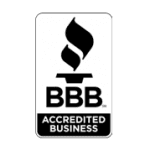 Eagle Watch Roofing is licensed, bonded, and insured, so you know that we are doing things right. If a job requires a permit for roof replacement, we will include the cost of the permit in your estimate. In fact, you never really have to think about the permits at all. We’ll determine if they are necessary, pull them if they are, and take care of all the paperwork. All you have to worry about is the final estimate. 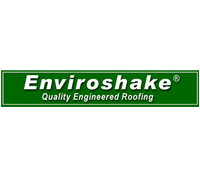 So if you are ready for a hassle-free, high-quality roofing experience, contact us today. 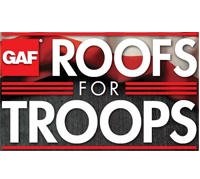 We’ll take care of your roof from A to Z, and you won’t have to worry about anything except enjoying your new roof.